A trademark can be a word, a symbol, a logo, a distinguishing shape, or a slogan that is distinctive of your goods and/or services. Registration affords protection in the country in which a registration is obtained. Trademarks can be renewed indefinitely. We can file foreign, European & International applications on your behalf. Inherently strong trademarks are coined words, and totally non-descriptive words. Trademark registration may be obtained for names already in use or for names to be used in the future. We also assist with licensing agreements. For more background information on trademarks please see our TRADEMARK BASICS section and/or schedule an initial consultation. First Consultation for Trademark Matters: It is advisable to bring a clean copy of your proposed trademark either in color or in black and white. You also need to bring samples of how the trademark is being or will be used such as packaging, advertising materials, etc. A trademark broadly speaking is a word or a symbol to distinguish or identify the source of goods or services that are being offered. A trademark can be renewed indefinitely. Trademarks have been used for decades in the well known marketing tool known as "branding". Trademarks are also used in some cases to protect valuable domain names particularly for companies whose businesses are web based or which operate exclusively through web based commerce. A word or design mark. A word or design mark is used by an entity for the purpose of distinguishing wares or services manufactured, sold, leased, hired or performed by that entity from those manufactured, sold, leased, hired or performed by others. This type of mark can be a word, multiple words or a design or a combination of words and designs or any mark "used to distinguish the goods and services of the owners from others". the area within which the wares have been produced or the services performed from wares or services that are not of that defined standard. the shape of a roof vent. Note: Trademarks that are registered on the Canadian Registry are entitled to use the registration symbol which is ®; whereas, marks that have not been registered, but are used in the market place and thus have obtained some protection under the common law, are entitled to use the letters ™. In order for a trademark to be registered it must meet some basic criteria which are defined in the Trademarks Act and applied by the Trademarks Office upon the receipt of a trademark application. a word that is primarily merely the name or the surname of an individual who is living or has died within the preceding 30 years. the name in any language of any of the wares or services in connection with which it is used or proposed to be used. There are other restrictions to obtaining registration of a mark which arise out of Section 9 and 10 of the Trademarks Act as well as geographical indications for wine and spirits. There are also exceptions for descriptive words and surnames which may become registerable particularly if they have been used by the owner in Canada or his predecessor in title to the point where they have become distinctive at the date of filing. In this case one has to provide evidence of distinctiveness to the trademarks office when filing either the name or surname of an individual or a descriptive or deceptively mis-descriptive trademark with the Trademarks Office. Those with a marketing or advertising background are often the first to suggest a name that "says it all" to consumers. There is logic in this, immediately after passing a restaurant with the name "Hamilton Coffee Shop" a potential consumer knows more or less what goods and services the business is offering. The name attempts to immediately undertake the heavy lifting when it comes to marketing; however, a descriptive name of this nature also has distinct disadvantages that may in the long-term outweigh the initial marketing benefits. Again using the hypothetical "Hamilton Coffee Shop" as an example, its descriptive name may initially be beneficial; however, this benefit will soon diminish if it fails to distinguish itself from its competition—which may operate as "West Hamilton Coffee Shop" or "North Hamilton Coffee Shop". Conversely, the value of an inherently strong name grows considerably over time as an indicator of reputation and goodwill. they are unique, arbitrary and often fanciful in that no one else is using that name– they are often coined words or invented words (not found in the dictionary). GOOGLE®, BLACKBERRY®, and XEROX® are all examples of inherently strong names as each exhibits all three of the characteristics above. A good example of an inherently weak mark is WORDPERFECT®. Microsoft capitalized on the weakness of this name when it launched its competing software WORD®. THE SHOE STORE, or FAST CAR WASH are other hypothetical examples of weak names. As discussed in Part II of this article, weak names make protection difficult and costly. In practice descriptive names tend to be the most frequent form of weak names encountered in this office for the reasons stated above—it "says it all". Forgoing the short term marketing boost of a descriptive name requires a long term view. Choosing an inherently strong name provides numerous advantages including the ability to defend against infringers. develop significant value and goodwill in the name—paving the way for a future sale of the name. In essence, an inherently strong name is sufficiently distinctive that customers will recognize it, and used in conjunction with remotely similar goods or services immediately suggests infringement. As such, over time the mark is more likely to develop value and function as an asset because it identifies a business and becomes synonymous with that business’s quality of work. By way of example, the inherently strong XEROX® trademark is valued by Forbes at $13.2 Billion. The owner of this mark, the Xerox Corporation, has every right to demand anyone who attempts to add or alter the name to cease their activities. It could easily shut down an imitator operating as "QUICK XEROX"; whereas, the operator of the weakly named "FAST CAR WASH" would likely not be able to shut down an imitator operating as "QUICK CAR WASH". Ultimately, one must weigh the short term benefits of a descriptive weak name against the long term benefits of an inherently strong name. The excerpt above was originally published as part of a larger article in the Hamilton Law Journal under the title: Selecting and Protecting Inherantly Stong Names by Mark Koch and Jim Lepore. Mark A. Koch Professional Corporation is a law firm practicing in the area of Patent, Trademark and other Intellectual Property matters and can be reached at (905) 549-5880. The respective protection afforded to these means of protection are not equal. The hierarchy can be described pictorially (See Figure 1 below) with registered trademarks reining supreme. not descriptive (or mis-descriptive) of its associated products or services. A long mark comprising multiple lines of text may be distinctive, but renders protection difficult as there is a great deal of material available for modification by an imitator. A merely descriptive mark precludes trademark registration and severely limits a user’s ability to demand exclusive rights. Invented or coined words, synonymous with inherently strong marks, are typically: distinct, non-descriptive and leave little room for modification. and putting the world on notice that the registered mark is not available to any new venture seeking a name. An unregistered trade name is often not part of any public record and may go undetected generating costly conflicts if a new entity inadvertently adopts the name. 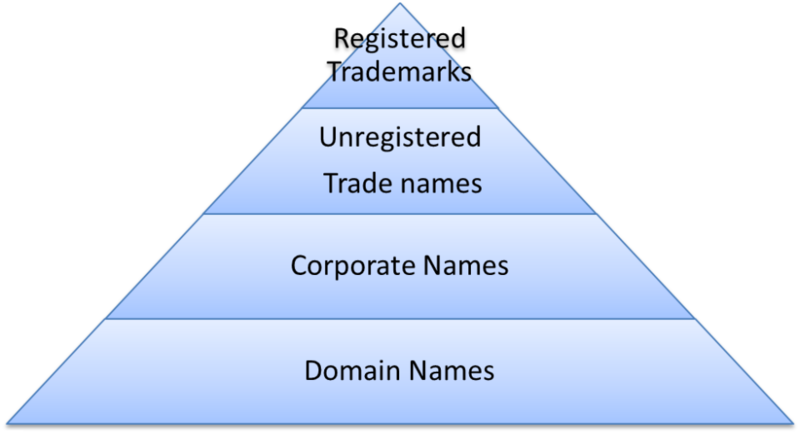 The remaining levels of the pyramid, corporate names and domain names, represent the lowest level of protection. Corporate names and domain names, many of which are not used in the sense of a trademark, offer little or no exclusive trademark protection. Unfortunately we have seen many individuals that mistakenly believe that a corporate name registration affords them trademark or trade name rights. Registration of a domain name or corporate name is likely insufficient to protect a name, especially in the long term. All too often, entities possessing only a domain or corporate name registration are required to change their name and/or forfeit their domain name (and consequently any associated goodwill) to the user of an unregistered or registered mark. In a technological climate trending towards increased automation of tasks by computer algorithms, the limitations of the NUANS corporate name search comes as a surprise. Essentially, what is sufficient to obtain a business name is usually not sufficient to clear as an operating trade name or a trademark. Corporate entities may be seeking protection for: a corporate name, a common law trade name or a registered trademark; each requiring significantly different levels of search for clearance. A NUANS corporate name search report is computer generated and required by the federal and most provincial governments when clearing new corporate names. The mandate of these reports is to list similar existing corporate names, business names, and trademarks for the purpose of determining the availability of a newly proposed name in a fair manner so as to avoid conflict with an existing entry. The threshold for availability is an exact match. As such, it comes as little surprise to corporate lawyers that word dividers such as spaces or slight variations in spelling are sufficient to avoid conflict within the NUANS algorithm. Further, the addition of an entire word almost always clears the name for use as a new company name. For example a hypothetical new name for a radar manufacturer "Earth Radar Inc." would be deemed available despite an existing entry for a radar design firm "Earth Inc.". Having obtained a business name following a NUANS search, corporations often begin using their corporate names in the sense of a trademark. In other words, the name is used in association with specific goods and services, serving to distinguish these goods or services from those of their competitors. In some cases a company may decide to register its corporate name or common law trade name as a registered trademark as it has become a valuable asset of the company. Both these actions raise issues from an intellectual property standpoint as the threshold for trademark registration is profoundly more stringent than that required for a corporate name or an unregistered trade name. A trademark and its associated protections are dependent upon (among other factors) a mark not being "confusingly similar" to any existing common law trade name or registered mark. Pursuant to the Trademark Act in determining whether trademarks or trade names are confusing, the court or the Registrar will weigh the surrounding circumstances. These circumstances comprise: the distinctiveness of the trade-marks, the extent to which they have become known, the length of time the mark has been in use, the nature of the goods/services/business, the channels of trade and the degree of resemblance between the trademarks in appearance or sound or in the ideas suggested by them. This indicates that trivial modifications such as spaces or even adding an additional word often are insufficient to alter the resemblance. The test for confusion further indicates resemblance is a matter of first impression in the mind of a casual consumer (who is somewhat in a hurry and has an imperfect recollection of the prior trademark), effectively raising the threshold for distinctiveness. Continuing the previous example the newly formed "Earth Radar Inc." would likely be considered confusingly similar to the existing "Earth Inc." and trade name or trademark infringement becomes a real concern. Further, if an entity sought trademark protection for a name, corporate or otherwise, based solely on a NUANS search report important conflicts can easily be missed. Omissions in a search report are significant as the first entity to file does not necessarily have priority. In fact a first in time user of a common law trade name may have superior rights over an applied for trademark that commenced use at a later date. Masterpiece Inc. v. Alavida Lifestyles Inc., 2011 SCC 27 confirmed that trademark priority in Canada remains on a first to use basis. Alavida Lifestyles Inc. operating in Ontario obtained registration of the mark "MASTERPIECE LIVING" in 2007, however Masterpiece Inc. operating in Alberta sought to expunge the registration on the basis it was confusingly similar with their unregistered common law trade name "MASTERPIECE" used since 2001. The Supreme Court of Canada ruled that Alavida’s mark should be expunged and that prior use of an unregistered mark can be grounds for opposing or expunging a registration of a confusingly similar mark. While an existing unregistered common law name must prove distinctiveness (usually through continued use over a long period) and contest the validity of a registration within five years (after five years, the existing mark must show the owner of the registered mark knew or have ought to know about the existing mark), this fact underlies the importance of augmenting a NUANS search with formal trademark searching and opinion if the client has any intention of using its corporate name as a common law trade name or trademark. What's in a name? For any business venture, a name represents an identity to clients or customers, establishing a reputation and level of performance. While computer algorithms can gather great volumes of information quickly, entrusting such a valuable asset to a rigid algorithm may prove short sighted if a business is forced to change their name, which we have seen happen all too often. Trademark and common law searching is more "art" than "science", additionally a trade name or trademark use or registrability opinion is invaluable to establishing a strong foundation for trademark protection going forward. Originally published in the Hamilton Law Journal under the title: What is in a Name? : the Limitations of NUANS Search as it relates to Corporate Names by Jim Lepore and Mark Koch. Mark A. Koch Professional Corporation is a law firm practicing in the area of Patent, Trademark and other Intellectual Property matters and can be reached at (905) 549-5880. A person who adopts a trademark or a trade name and uses that trade name or trademark in commerce in a given territory will enjoy a certain ambit of protection for the use of this trademark in the territory in which the mark has become well known if only the mark has developed a reputation. These rights are usually referred to as common laws obtained through use of the mark. Therefore, for example if a company begins using a certain trademark in Ontario, but fails to use this mark in any other Province and/or in any other geographical area then the user of this mark will only have common law rights to this name in the Province of Ontario and in no other Province and/or geographical area. A registered trademark on the other hand gives the owner of the trademark the exclusive right to use through out Canada the trademark in respect of the wares or services for which they have registration. These rights are not dependant upon having used the trademark in every Province or territory in Canada. Prior to preparing and filing a trademark application it is highly recommended that a trademark registrability search be carried out. A trademark registrability search will normally include searches of the federal trademark registry, but it will also include searches of telephone directories, trade directories, domain name searches, internet searches and business name searches. Prior to applying for registration of a trademark the applicant would like to know if there are any conflicting trademarks and/or common law used trade names which would prevent use and registration of the name. Provided that the search results are positive, meaning that one is able to obtain registration and that there are no conflicting trademarks and/or trade names, the applicant can then file a trademark application as either an intent to use application which means that the applicant intends to use this trademark in the future in association with the goods and/or services for which one is seeking registration, or one can file the application as a use application, meaning that the applicant is currently using the trademark in association with the goods and services for which one is seeking registration. The application will come before a trademarks examiner who will examine the application to ensure all formal and other requirements have been met. Once the examiner is satisfied that the application meets all of the requirements of the Trademarks Act and is registerable, the trademark will be advertised for a period of two months during which time any interested parties can come forward and oppose the application on the basis that they have superior rights to the applicant. Upon completion of the two month advertisement period, provided no oppositions have come forward, the examiner will issue a Notice of Allowance at which time the applicant must pay a issue fee and provide the trademarks examiner with a Declaration of Use in the case the application was filed as an intent to use application. Once the registration issues it is valid for a period of 15 years from the time of registration and can be renewed in 15 year intervals indefinitely. At some point in time the applicant must commence use of the trademark. A trademark is deemed to be used in association with wares (goods) if at the time of the transfer of the property in or possession of the wares in the normal course of trade, the trademark is marked on the wares themselves or on the packages in which they are distributed or it is any other manner associated with the wares that notice of the association is then given to the person to whom the property or possession is transferred. A trademark is to be deemed to be used in association with services if it is used or displayed in the performance or advertising of those services. Additionally a trademark that is marked in Canada on wares or packages in which they are contained in when the wares are exported from Canada they are deemed to be used in Canada in association with those wares. Trademark rights can be lost if use of the trademark is not commenced or if use of the trademarks ceases for a longer period of time with no intention to resume use of the trademark in the future. Trademarks are an essential tool necessary for the branding of products and/or services in the market place. Trademarks can be perpetually maintained and as a result the goodwill and value created in a brand name can result in significantly increasing the value of the business venture. In addition, trademark protection is often obtained to protect valuable domain names particularly for companies who have a significant internet presence. Outdated browser detected, please consider upgrading!